Laps on the K2 Happy Hour Snowboard feel like accidentally walking into a prime happy hour deal. The lightweight and playful attitude of this deck will continually surpass expectations, allowing you to whip out stylish maneuvers off every popper. The Precision™ Baseline provides a high-energy cambered carve that unleashes a ton of snap while allowing you to absorb sloppy landings with finesse. Laid up with K2 s lightning quick 4000 Sintered Base, the K2 Happy Hour Snowboard has the speed and shape to make every run a killer one. Lifted™ – Bringing a new level of pop to K2's baseline offerings, lifted takes the flat between the feet foundation and raises it. This brings in the pop of a cambered board while maintaining the neutrally weighted contact points that give you the straight tracking, effortless precision of a flat board. Precision Baseline™ – With flat contact points in the tip and tail, Precision Baseline™ turns and tracks like a traditonal camber board but without the unstable hook. By spreading the initial edge contact out over an extended flat contact zone, rider applied pressure is dispersed allowing for a feather light touch and quick response without the harsh hook. 6 - 8 – A stiff deck that has a little give for a deck that remains stable at high speed. WH3 Core – Three species of renewable wood paired with two strips of HONEYKOMB™ material between the bindings and rails. Ollie Bar – A totally new approach to adding pop to a snowboard. Built in place in a pre-loaded, cambered shape, it solves the concern that rocker board don't have the pop camber boards have. Made with a secret layup of carbon, kevlar, and urethane layers, the Ollie Bar is positioned in the center of the board between the binding inserts. Strong ollies and pressing power doesn't come from the tail alone. The backbone center section is actually more critical for smooth, even pressure. You gotta try it to believe the pop. Carbon Web I – Optimized to match K2's baseline profiles, carbon web boosts the feel and energy return of K2 snowboards. Offered in two levels of sensitivity, the Carbon Web extends out beyond the contact points, supporting the whole length of the tip and tail. 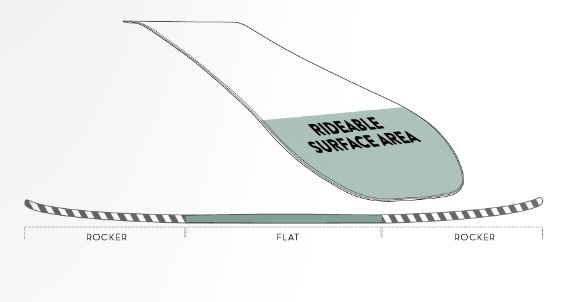 This results in a more connected feedback loop from terrain to rider. Triaxial Fiberglass – A glass laminate with diagonal layers that stiffens the board torsionally, giving you improved edge hold and increased stability for those off-axis landings at speed. Biaxial Fiberglass – The classic structure laminate, biax glass provides balanced all-purpose flex and performance. Patented Hybritech™ Construction – Hybritech™ is the most efficient way to make a snowboard without sacrificing one ounce of performance. Featuring sidewall along the running surface that flows into the nose and tail providing low swing-weight, optimized turn initiation, and durability.